Iceland has a population of around 325,000, roughly half of whom live in or close to the capital city of Reykjavik. The rest of the population live mainly around the coastline of this wild volcanic country, which is roughly the size of the British Isles. Low cost airlines are now operating to Iceland, as well as the national carrier Iceland Air. This has opened the country to the short break and weekend leisure traveller with flights around 2 to 2 and half hours from Northern airports. Depending on the time of year, visitors can go whale watching and see a variety of whales in the waters just outside of Reykjavik, marvel at the Aurora Borealis, go Ice hiking or take Jeep adventures and much more. In summer, the daylight is almost 24 hours per day, so no excuse for missing any of the sites! Iceland's history and heritage are vitally important to the islanders and examples and reminders of its rich Viking past can be found everywhere. Museums and Viking Villages are available for visitors to find out more about this fascinating destination's history and folklore. The islanders are forged from the wild geography of fire and ice and yet they are an incredibly friendly and well educated people, the vast majority of whom speak perfect English. Reykjavik is a clean and modern city with streets dotted with a variety of shops, bars, restaurants and cafes. The clothes shops sell a variety of things from high-end fashion, to practical winter and ski wear. Harpa, the iconic Opera house and conference centre, is a stunning glass architectural masterpiece and is the venue for local and international plays, live bands, music and Opera. Public transport is cheap and efficient, however drinks prices are quite expensive, with both locals and visitors filling the bars during the daily 'happy hours.' Friday and Saturday nights are a Wow in the Laugavegur area of the city, where the Runtur - bar crawl takes place. Things warm-up around midnight until around 5 in the morning! Whale watching* is popular in spring and summer. There are several companies which take visitors from the old harbour in Reykjavik out to Faxafloi Bay. Each tour is different, with sightings of the most common species almost assured*, especially Minke and Humpback whales.Also, expect to see sea birds such as Puffins, Guillemots and Arctic Terns too. The other popular attraction is the opportunity to see the Northern Lights* (Aurora Borealis). For the best chance* of seeing these Lights, travel September/October or February/March, avoid a full moon and travel out of the city on one of the many excursions. Not to be missed is the great 'birds eye view' of the city. Take the lift (250 feet) to the top of Reykjavík's highest building, the Hallgrimur's Church. * Please be aware that weather conditions may not prevail during your stay and finding whales or seeing the Northern Lights is by no means guaranteed. 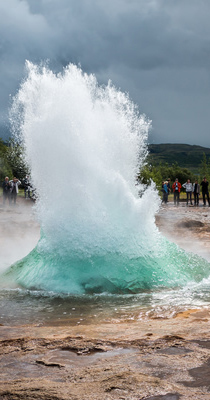 The Golden Circle Tour is Reykjavik's most popular tour, a full day, visiting Gullfoss, the incredible golden waterfalls and the hot springs of Geysir and Strokkur at Haukadalur valley. Here you can see the explosion of hot water every six or seven minutes at this amazing natural phenomena. The tour then moves on to the Thingvellir National Park,both an area of natural beauty and a world heritage site with great historical significance to the islanders as the scene of its initial government and law making venue. This tour can also be arranged by private Jeep or minibus. The Blue Lagoon A trip to Iceland is not complete without a trip to the Blue Lagoon. It is a geothermal hot spring that is said to have healing properties. A good time to go is when sunlight is available and towards evening time as it is really amazing to see it during both in daylight and at night-time, as the water is an iridescent blue. Glacial Hiking If you prefer to do your sightseeing on foot, Iceland is a walker's dream. There are several organised glacial hikes from Reykjavik, including a Volcanoes and Glaciers trek. Some tours combine activities such as a Jeep tour or Ice climbing-ask us for details. Other activities Iceland provides a myriad of activities, depending on the time of year you go: Snowmobiling, Biking & Quad Biking, Hiking, Glacier Exploring, River Rafting, Snorkeling, Diving, Horse Riding, bird watching, to name just a few! Call 0800 849 1285 or alternatively Click here for a quick quote. Travel Empire's favourite spots in Reykjavik; head down to the Laugavegur area for shopping and nightlife the Koffin Bar gets our vote. The Lebowski Bar is not to be missed either!